Well, today is a flashback and a reminder for each of you. I know kamp friends can sometimes come and go but something about Kanakuk's friendships (the true ones) seem to be very very different. Now before you go thinking, "Ashley, how do you know? You weren't a kamper." I would say you are right. But many many moons ago I was a first year, new to kamp ever, staff gal and the summer of 2000 changed my life forever in so many ways (hello...met the hubs which brought about 3 wonderful littles and also I now work for that same kamp that I still LOVE) but one awesome, surprising, humbling blessing was the 2 gals that were my co's...but have now become dear dear friends. Picture above: Summer 2000...crazy pic of 3 blonde bombshells (named by Trish Helsel) and we were counselors together for cabin 11, woop woop! Fast forward 11 years to Summer 2011 and Kristin Kobosky and I were able to work alongside of each other as she was a part of our K2 Leadership team. What in the world! She is one of the most gifted people I know. She lives authentically and pushed me every day that summer in being real and spurring one another along! Treasure her! She teaches in Tennessee and boy would those students be so lucky! I still beg her to come back to kamp...summer 2013? So my K2 friends, don't doubt the friendship that starts at age 10 at K-1 that is so very special. 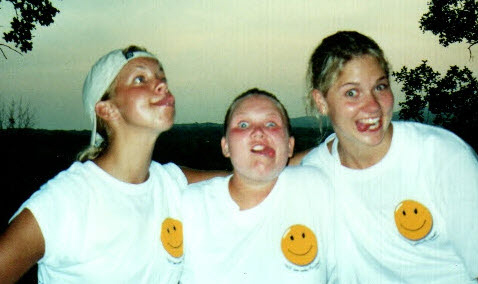 You truly never know what can come from those dear friendships that begin at some crazy summer camp!